One of the most important features of SNOW is our open world. We believe that we are building the first winter sports game to feature a massive, dense, open-world mountain environment. 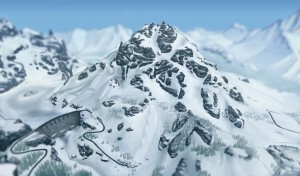 As the mountain is actually really big and filled with countless routes and features, we figured we'd need to provide players with a way to better understand the environment they are in. So instead of implementing some type of mini-map, which we feel isn't true to the spirit of the game, we decided to do something else. What you can see above is an illustration of Sialia's East Face. This is 1/4 of the entire mountain and is what we have spent a majority of our time working on to provide players with an example of what to expect from the rest of the mountain. As you can see, there are plenty of lines to ride down and different features to explore including the terrain park and the dam/frozen lake. When riding around in Free Roam, players will have access to this map to familiarize themselves with their surroundings or chose a new spawn point to start from (more on that later). In addition, this map will be used when displaying events, challenges and competitions. Looks great! However, all the screenshots and media I've seen so far make the environment look like boney late season spring conditions. Will there be areas or times when the rocks are actually (at least on top) covered with snow? If not, I will be forced to be slightly irritated. Keep it up, making games isn't easy... I know. Fix your comments background for chrissakes.